Square Enix's first two Street Fighter IV figures, based on series "heroes" Ryu and Chun-Li, have just hit shelves. Part of the company's Play Arts line, they're big, they're detailed and they're a little on the expensive side. They're certainly heavy, that's for sure. Standing just over 20cm each, these puppies are hefty, which is a good thing. Light figures, especially ones without stands (and these don't have stands) are prone to toppling from a shelf at the slightest nudge, so in that regard, we're off to a good start. I also liked the detail, which you can see in the gallery above. There are a ton of nice little flourishes in the sculpts, like texturing on Ryu's belt, "sweat" effects and even wear and tear on some articles of clothing. About the only let-down in this department are both faces, especially Ryu's, but since both figures come with alternate choices, some drop-off in quality was to be expected. And the styling? I like it. Many of Square's Play Arts figures have a very hard, chunky design which can look at odds with the source material, but in this case, it matches Capcom's Street Fighter IV designs really well. Ryu's face may look weird and Chun-Li's thighs massive, but they're like that in the game, so these figures are only doing their job. The only major gripe I had with both figures, and this goes especially for Ryu's torso and Chun-Li's knees, was their joints. They're enormous, and at times leave gaping holes in the figure, yet for all that Ryu can't get in a proper Hadouken pose and Chun-Li can't sustain a kick without falling over. Seems like a bit of a waste, as I would have preferred finer detail and less joints if the joints weren't going to guarantee classic Street Fighter poses. Square Enix has really doubled down on its gaming licenses lately for its Play Arts line. 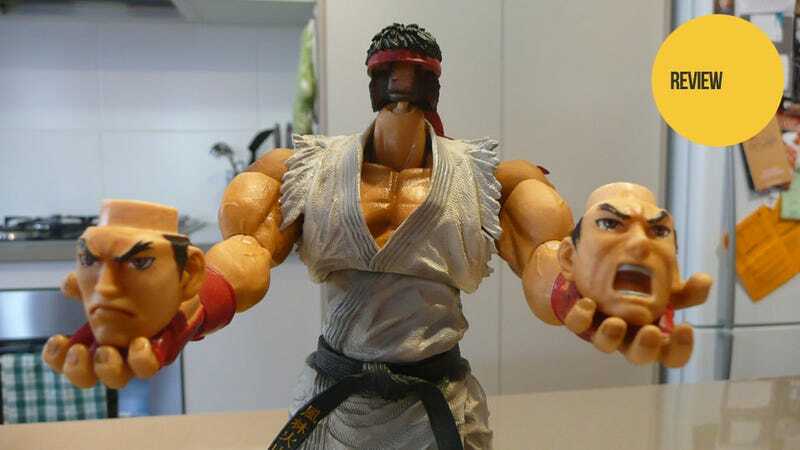 With a ton of figures to come in the 2012, from series like Metal Gear, Batman and Uncharted, it was important these Street Fighter offerings got the holiday season off on the right foot. Which they do. On giant, giant feet. You can buy both Ryu and Chun-Li from Square Enix for $55 each.